Nova Verta USA offers a wide variety of automotive paint booths, truck paint booths, and industrial paint booth applications. With three distinct operating modes and indirect heating systems, no other manufacturer’s system offers the start-to-finish spray paint booth operating efficiencies available from Nova Verta. How much can you expect to save over the life of your booth? Contact us today and we’ll do a custom analysis. Prep Cycle – Nova Verta’s first operating mode, the Prep Cycle, optimizes booth conditions while final masking and tack off is performed. Using a variable frequency drive and make-up unit with a stainless steel heat exchanger, the Nova Verta system warms air and safely re-circulates it through the spray booth – without exposing operators to the dangers of carbon monoxide.No other paint spray booth system provides a Prep Cycle that creates OSHA-mandated working conditions, heats the air, maintains air pressure, brings metal to the desired spray temperature, and generates monthly utility savings of 35% or more when compared to competitive systems in its class. Spray Cycle – Once prep work is completed, a single press of the Controller shifts the Nova Verta spray booth operation to the Spray Cycle. At this stage, a steady stream of freshly heated air is provided into the spray booth and a constant, ideal booth pressure is automatically maintained at a minimum. The exhaust system is dry filtered using a reverse incline direct driven fan using a variable frequency drive for motor speed control, eliminating the need for inefficient pressure control dampers, or operator intervention. Cure Cycle – After the painting process is complete, another press of the Controller puts the booth in Cure/Bake Cycle. The Bake Cycle, like the Prep Cycle, effectively re-circulates air, minimizing electrical and fuel consumption. 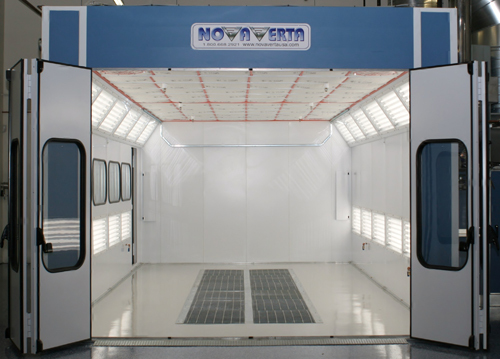 Compared to other paint spray booth systems in its class, Nova Verta's spray booth provides higher-velocity airflow, shortening cure times on conventional and waterborne paints.